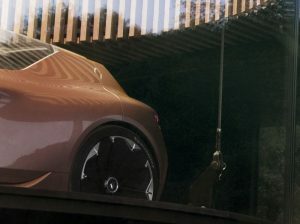 Renault has published a teaser image of a new concept, dubbed ‘Symbioz’, ahead of its reveal at the Frankfurt Motor Show next week. Marrying up autonomous, electric and connected mobility features, the concept will showcase future developments in Renault’s Z.E. electric technology – as denoted by the ‘z’ at the end of ‘Symbioz’, while the name is also derived from ‘sumbiōsis’, the ancient Greek word for ‘living together’. It follows previous Renault electric concepts, including the Trezor two-seater electric concept car unveiled at the 2016 Paris Motor Show. Further details will be revealed at the full unveiling at Frankfurt on 12 September. The show will also see the world debut of the Mini Electric Concept, which previews an all-electric production car due to join the Mini line-up in 2019 as its second EV.For more of the latest industry news, click here.